As I sit down to write this I am in the hospital in Enid, Oklahoma, with my mother. She suffered a stroke this past Thursday and now she is in a room waiting until Monday morning for a test. She is not very comfortable right now, but they just moved her around so hopefully she will begin to rest a little. The journey that she is on right now is similar to the journey that others have been on. Her struggle is not only to get past the stroke, but to regain her strength and functionality. Right now what happens is definitely in the hands of God. Yes, He will work through the doctors, nurses and staff that attend to her. He will use them to bring her comfort and peace. The nurses have been wonderful as they have taken care of her as well as taking care of us. Hospitals are not the place that most of us want to be. We usually only go there when something is taking place in our lives or the life of someone we love and care about. As a pastor, I spend time visiting with people in the hospital, but honestly it is not my favorite time. While I may have the opportunity to minister to a family that is experiencing issues, it is still a difficult time for me. Honestly, I would rather go spend time with them at their homes. Yet hospitals are a place where our loved ones can receive the help they need when they are going through a time of physical struggle. My mother is having a tough time this evening, but in the midst of her struggle, I know that she is at peace. This is a woman who has always placed Christ at the center of her life. She taught her children to love the Lord and to hold to Him regardless of what is going on in their lives. I can still remember growing up and her making sure that we kept our focus on Jesus no matter what was happening. She would make sure that we were in Sunday School each week. Then we would sit on the second row, piano side for the Worship service. She and Dad made sure we could hear the Gospel shared even if it was coloring a picture of Jesus teaching the children. Even when she walked through the death of Dad (plus her parents and 10 of her siblings), she continued to hold to her loving Savior. I’m sure it wasn’t easy, but she did it. To her, Christ was not only her Lord and Savior but also her strength, help and hope! Believe me, raising a son like me surely kept her prayer life going strong! I am sitting here watching her sleep and thinking about all she has done for us through the years. She always presented herself as a woman of righteousness. 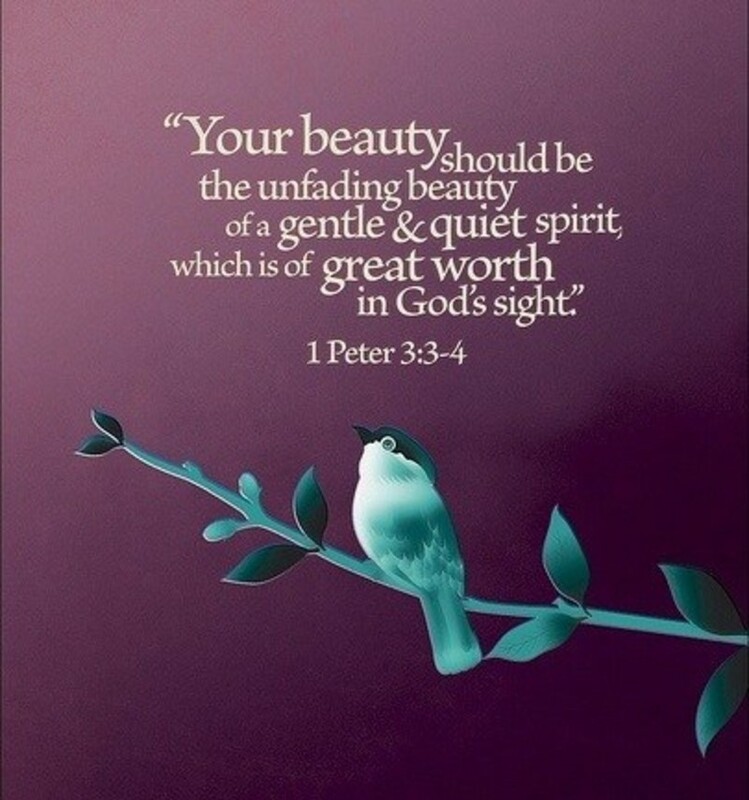 She always dressed nicely, but the truth is that her spiritual beauty is what she focused on. It seems to me that what we wear and how we look has become so important to us that we often fail to focus on what is important. 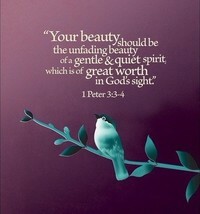 God is not nearly as concerned with the clothes we wear as He is how we are dressed spiritually. Mom isn’t dressed to leave the hospital room, but she is still adorned ‘with the imperishable quality of a gentle and quiet spirit’. It is that which points to her true beauty. Thanks Mom for being that true woman of beauty. Love you!